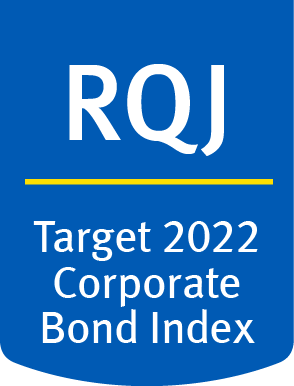 Provide income, for a limited period of time ending on the RBC Target 2022 Corporate Bond Index ETF termination date, by replicating, to the extent possible, the investment results that correspond generally to the performance, before the RBC Target 2022 Corporate Bond Index ETF’s fees and expenses, of the FTSE Canada 2022 Maturity Corporate Bond Index™. The bonds held in this portfolio all have an effective maturity date of 2022 as determined in accordance with a rules-based methodology developed by PC-Bond. † Distributions by the RBC ETF that are not paid in cash but result in additional units of the RBC ETF. These distributions should be accounted for by investors for tax purposes by adding the distribution amount to the adjusted cost base of the units held. †† The exact tax treatment of the distributions for a calendar year is calculated after the RBC ETF's tax year-end. As a result, investors will receive an official tax statement from their broker detailing the type of income they have to report for tax purposes for the entire year and not for each distribution. Commissions, management fees and expenses all may be associated with investments in exchange-traded funds (ETFs). Please read the prospectus or Fund Facts document before investing. ETFs are not guaranteed, their values change frequently and past performance may not be repeated. ETF units are bought and sold at market price on a stock exchange and brokerage commissions will reduce returns. RBC ETFs do not seek to return any predetermined amount at maturity. Index returns do not represent RBC ETF returns. RBC ETFs are managed by RBC Global Asset Management Inc., an indirect wholly-owned subsidiary of Royal Bank of Canada. The indicated rates of return are the historical total returns for the periods including changes in unit value and reinvestment of all distributions and do not take into account sales, redemption, commission charges or income taxes payable by any unitholder that would have reduced returns. All rights in FTSE Canada Universe + Maple Short Term Overall Bond Index and FTSE Canada Universe + Maple Bond Index, FTSE Canada 2018 Maturity Corporate Bond Index, FTSE Canada 2019 Maturity Corporate Bond Index, FTSE Canada 2020 Maturity Corporate Bond Index, FTSE Canada 2021 Maturity Corporate Bond Index, FTSE Canada 2022 Maturity Corporate Bond Index, FTSE Canada 2023 Maturity Corporate Bond Index, FTSE Canada 2024 Maturity Corporate Bond Index and FTSE Canada 2025 Maturity Corporate Bond Index (collectively, the "FTSE GDCM Indices") vest in FTSE Global Debt Capital Markets Inc. All rights in FTSE Canada All Cap Domestic Index, FTSE USA Index, FTSE Developed ex North America Index and FTSE Emerging Index (collectively, the "FTSE International Indices") vest in FTSE International Limited ("FTSE"). All rights in the FTSE World Government Bond Index (Currency-Hedged in CAD) (the "FTSE FI Index") vest in FTSE Fixed Income LLC. "FTSE®" is a trade mark of the relevant London Stock Exchange Group ("LSEG") company and is used under license. The FTSE GDCM Indices, the FTSE International Indices and the FTSE FI Index (together, the "FTSE Indices") are calculated by FTSE Global Debt Capital Markets Inc., FTSE International Limited, and FTSE Fixed Income LLC, respectively, or their agents, as applicable. The LSEG companies, FTSE Global Debt Capital Markets Inc., FTSE International Limited, and FTSE Fixed Income LLC, and their licensors (collectively, the "FTSE Licensors") are not connected to and do not sponsor, advise, recommend, endorse or promote the ETFs and do not accept any liability whatsoever to any person arising out of (a) the use of, reliance on or any error in the FTSE Indices or (b) investment in or operation of the ETFs. The FTSE Licensors make no claim, prediction, warranty or representation either as to the results to be obtained from the ETFs or the suitability of the FTSE Indices, for the purpose to which they are being put by RBC GAM.